Details on the US versions of the sets aren't available yet, but we can glean plenty from the Japanese pricing. There's a three stage cycle to TV releases from Japanese companies and we're at the really frustrating one. The first step is showing off new sets at CES. That's an exciting one. The final step is releasing the TVs in the US - also exciting. Right now, we're at the point where companies are going to be releasing their sets in Japan, which does us very little good. Still, we can get a little glimpse of what to expect from the US releases by what's announced for Japan. 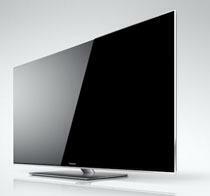 Panasonic revealed that its upcoming VT50 series of plasmas will be hitting Japanese stores on April 20th. the 50" version runs 360,000 yen or $4,664, while the 60" set comes in at 500,000 yen, or around $6,478. Pricing tends to be a bit lower in the US, but don't expect to see huge drops. LCD TVs will be coming out on March 9th along with GT5 plasmas. Of particular interest is the ET series, which is the first from Panasonic that uses passive 3D glasses.